Adding to the Runoffgroove library. 2013 is off to a flying start! I like the idea of this minimal parts light overdrive, will give n00bs like me a chance to poke around with values and see exactly what does what. The videos I found on YT show a high cut and somewhat of a bass boost (though I listened on laptop speakers, so there's really no telling) would changing some of the caps to a lower value help with clarity? Thanks for this Mark, can't wait to try it! wow guys you are the best. If you want more low end, you should up the 47n and/or 22n. I think I had the wrong idea before, on subsequent auditions, it's the harshness of the high end that I want to minimize. I might try a few different J201's to see if that's the problem. This question was made a long time ago but in case there's someone else wondering, I've been using a 50k B pot in place of the 8k2 resistor as a tone pot. The higher the resistance here more high-end gets rolled off. I'll eventully set on a switch with a 22k resistor for bright and a 47k for dark...8k2 is mostly too bright for me and 22k is enough to mellow it up some. None of my J201s get close to 115mV source. 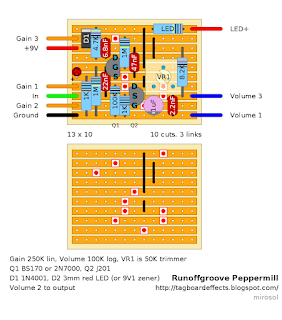 Would using a trimmer for the source resistor be advisable? Just built this - nice sounding 'low-verdrive'. None of my J201s came close to 115mV though. The lowest I could find was 140mV, which sounded nice. It seemed the higher the source voltage, the less drive was available, with almost no distortion at all from a J201 with a 300mV source voltage. Is that how you'd expect it to work? Am I able to replace 50k trim with a 50k Lin pot? If so, what lug goes where? Thank you!! How are you guys figuring out the source voltage? What do you mean exactly Steve, getting it closer to that what is specified by RoG? If that's it, see that 1k resistor going to the source of Q2? you can either increse its value or decrease it and take some measurings to see if you are getting closer to 114-115mv. If I can remember, I had that 1k resistor soldered and the voltage on Q2 was a little high... 200mv maybe.. then I tried a 330R and it got down to 120mv (that's what I have on now). Rebiased the trimpot to ~4.5v... It does increase the crunch factor without changing the overall character of the effect. I'm also having trouble with my build. I did it on perf, but none of my questions are related to layout. I've checked and triple checked, and it's correct. The symptom is that the Gain knob does essentially nothing, or is REALLY subtle to the point of being almost undetectable. Volume works just fine, and the pedal gives a really good clean boost as it is, but unless I'm mistaken, there's supposed to be some hair available. I have tried several different J201, and the closest I can get any of them to 115 mV is 109 mV with the trim pot maxed out (9V). I'm going to try Iago's suggestion of swapping the source resistor for a different value. If lowering the value made the voltage go down for Iago, raising it should make the voltage go up for me, right? I'll try a 1k5 and see where that gets me. Quadruple-checking the layout worked. 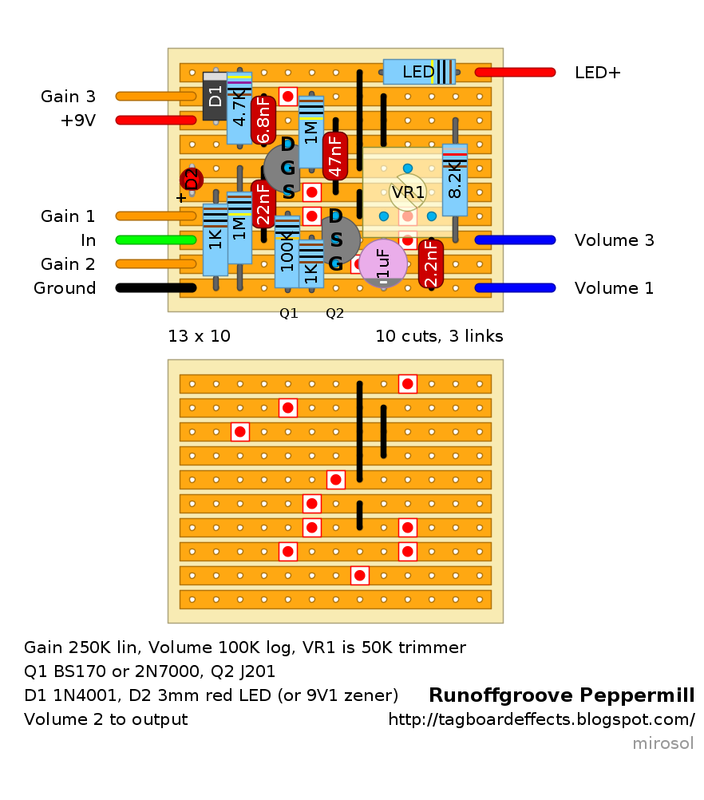 I had a 1M resistor between lug 1 of the gain pot and ground instead of 100k. I put a 110k in parallel, and it's wonderful now--even though I still get only 109 mV at the source of Q2. Lots of nice bark when I dig into it. I know this is an old post but if anyone sees this and knows the answer i will be very grateful. Where does the LED+ wire go when wiring up? And should the LED have the anode(+) side to the right? The LED im taking about is the one in top right corner, that looks like a resistor. Is it just a resistor named LED ? as taylor said that the resistor for the status LED, which you will also see on some layouts listed as CLR. there is no set value, as you use what you like you us, typically up to 10k. the higher the resistor the dimmer the LED. Most common people use 4.7k, as it's not too bright or too dim. i like 2.2k, which taylor mentioned below as a typical value. a lot of guys feel 2.2k is too bright. i like them bright enough that i can see it on stage no matter how bright the stage lights are, but many guys find that to be blinding. I believe that goes to the LED indicator that lights up when the pedal is engaged. the typical value for that resistor is 2k2, iirc. A little late to the party but I just built this and after some cross reference, I used a PF5102 in place of the J201. I Biased the Drain to 4.5 volts and it resulted in a very transparent boost/overdrive. I'll have to spend some time with the 1k resistor on the source to see how the voltage there influences the tone and drive. My first impressions are that this is a really nice clean boost that can get pretty gnarly as you crank up the gain and/or level controls. Definitely a good addition to the pedal board. I may build a few more and stretch out the layout to be less crowded. I'm using a readily available and cheap PF5102 in place of the J201 in Q2. The result is a decent cleanish boost without a lot of fuzzy overtones. It's nice but not really giving me a lot of overdrive. After I built it, I didn't do much with this pedal for a while because it wasn't giving me anything I couldn't get from other pedals. It does have a nice voice to it but I wanted something with more gain. To that end, I just changed the 1k resistor on the source of Q1 and exchanged it for a 300ohm resistor. That increased the gain in a pretty huge way. It still has that sharp flavour to it. That hasn't changed but now it's got some balls and has definitely earned a place on my pedal board. I really like it now!